With as busy as most peoples' lives are, precious little time is left over for recreational reading. A seemingly endless selection of engineering monthly publications are available at no cost: High Frequency Electronics, Microwaves & RF, Microwave Journal, EE Times, Microwave Product Digest, et al. Most libraries carry copies of science magazines like Discover, Popular Electronics, Scientific American, and Popular Science, that are freely available; some libraries even allow you to check them out for a week or two. Add to that list the plethora of online reading material available. All the aforementioned provide a healthy diet of information overload. Maybe for people working in the science or engineering realm that can be considered not so much recreational reading as competency maintenance. So with all the free or mostly free information available, why would I suggest that you add the American Radio Relay League's QST magazine to your reading list even if you are not a Ham radio hobbyist? Simple. The articles presented are always, without exception, well-written and chock full of information that is profitable for consumption by engineers and technicians. The magazines that I read each month are gone through literally from cover to cover; if I do not feel compelled to do so, the title gets dropped from my list. That is not to say that I read every last word of each one, but I am sure to not miss anything I consider useful. In fact, a lot of the material I get for the weekly and monthly content for RF Cafe comes directly from those sources (sometimes it comes from people sending me e-mails). Since receiving QST as part of my ARRL membership - which began last spring - it has assumed an honored spot on my list. Right at the top of the chart of my favorite features are the monthly Q&A-format columns, because the guys hosting them are extremely knowledgeable about all aspects of RF. The Doctor Is In, written by Joel R. Hallas (W1ZR), is the first feature I look for. He is the kind of guy you would like to have as a mentor when you show up for work, fresh out of college, on your first day on the job. You can tell from his answers to questions that he knows most of the stuff cold, and doesn't have to go look it up. I had the good fortune to work with a guy just like him: Jim Wilson, a life-long Ham and engineer at Westinghouse in Annapolis, MD (likely retired now). I was a technician at the time. 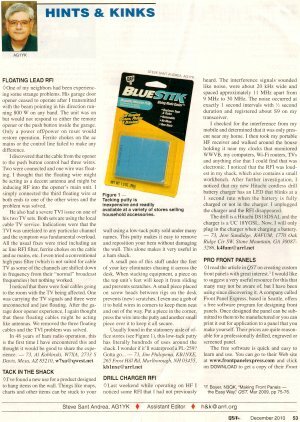 The scanned page to the right is an example from the December 2010 edition of QST (it is purposely illegible in order to not violate any copyright). Topics such as SWR matching, mast-mounted antenna configurations, proper wattmeter usage, and a very eye-opening (even to W1ZR) RFI sleuthing exercise are covered. 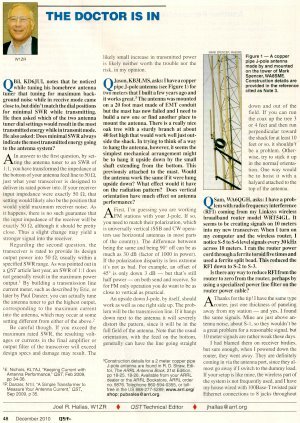 It is not unusual for Mr. Hallas to include antenna plots or other more technical content as part of the answer to a question. Another very well done column is Hints & Kinks, by Steve Sant Andrea (AG1YK). As the title suggests, you can expect to find all kinds of good tidbits on how to implement your ideas, including solving some issues that have been evading and confounding you for a while. Sometimes those ideas come from reader submissions, while others are Mr. Sant Andrea's ideas for the questioner. RFI, EMI, and other noisy gremlins are a continual nuisance to everyone involved in radio communications, so this column's frequent attention to such matters, including the December issue, make for very interesting reading. For those interested in vintage radios and their accompanying history, John Dilks (K2TQN) provides an interesting read. Having restored an old Crosley floor model radio many moons ago, I enjoy the column. There are usually some cool photographs printed each month. H. Ward Silver (NØAX) does a series that is a little more technically rigorous, which helps to give balance to the magazine's content. Even after being an engineer for 20 years and a technician for 10 years before that, I still find myself sometimes thinking, "Oh, yeah, I used to know that!" 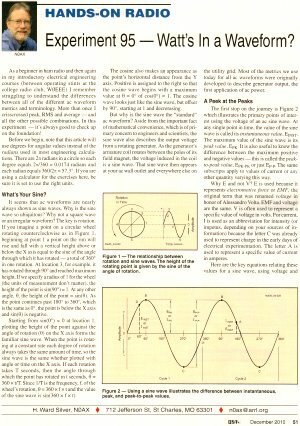 In the December edition of QST, shown below, Mr. Silver discusses the makeup of a sinusoidal waveform. If you are a little rusty on how to convert between peak, effective, and average voltage and current, or how to calculate the power under the curve, this is a great way to do a refresh. Even though I know those particular formulas by heart after working with them forever, it is still useful to read through everything - even if it just a proofreading exercise in case an error slipped in (so a correction can be printed). Other features of the magazine include product reviews, news about amateur radio events at home and around the world, and columns written by guest authors. In fact, QST is yet another possible venue for you to potentially have your own articles published. If you have submitted a relevant paper to other magazines but have not made the cut, maybe with a little editing to fit the QST format you can get it published there! It's worth a try. Remember that QST's vast audience is composed of not just hobbyists, but career technicians and engineers, all of whom appreciate fresh ideas. So, I highly recommend signing up for your own copy of QST each month since the full content is not made available for free online (they have to make money to cover costs and run the organization). 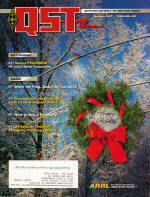 The subscription is included in a yearly membership in the ARRL, which at this time is a mere $39 per year. After finishing with my copy of QST each month, I put it in a stack with most of my other magazines to drop off at the local library, doctor's office, or dentist's office. Hopefully, doing so will inspire someone else to get involved, or at lease gain an appreciation for the activities and services provided by others. You might want to consider doing the same. Along with the magazine, the ARRL offers many world class quality publications that are useful for professionals, all at far less than what you pay for titles by the "big boys" like Artech House and Cambridge University Press. Check out the ARRL storefront.